I have the last model produced in 1958 - the Model IIB - with lever wind and greater rangefinder magnification. These are very heavy - mine is just under 900g with the lens. The Rokkor is a 'modern' 6 element 5 group, fully multicoated lens. 10 aperture blades taking a star shape at F2.8 to F8. Click stops on the aperture! The Model 35 is nice but has a bit of an exaggerated reputation. The shutter curtain is not durable being plain cloth, and the shutters are not the most durable design but certainly not the worst either. Mine still works perfectly, though I need to get it CLA'd if I want to keep it working. I have a feeling that all of the controls are not as smooth as they can be - dried lubricants etc. The viewfinder is without framelines, made solely for the 5cm lens, and is too dirty and cloudy to enjoy using at the moment. The later 'Sky' had a brightline viewfinder with switchable framelines. I believe this was also the first Japanese camera to include a hot shoe and a self timer! Unfortunately the hot shoe connection was dropped from my model and it's stuck with a PC-Sync port on the back. Sync speed is an epic 1/20! The biggest let down on this camera is the shutter - despite so many models being produced in the series, it still has a rotating shutter selector on wind. 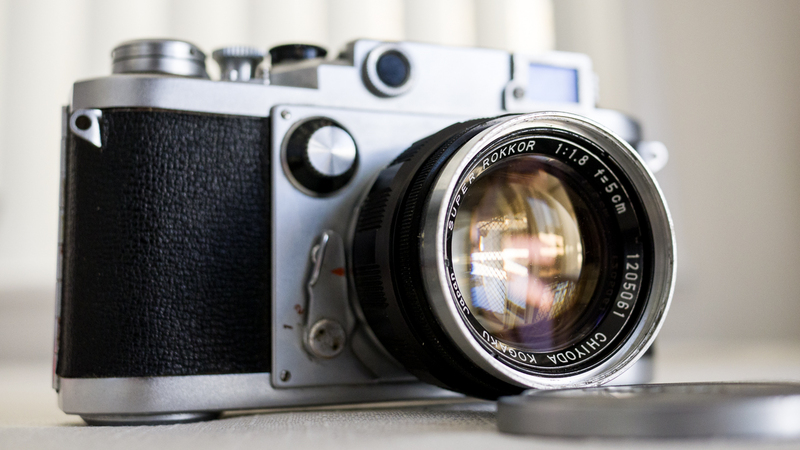 At least the shutter does not appear to be damaged by prematurely changing the shutter speed before winding, however then the knob will be displaced and you will have to re-set it onto the correct post. Most of the changes between models were small, generally cosmetic. I think there are 12 models in total with many sub-models in between as changes were introduced during production with concurrent serial numbers. Overall it's a nice camera, but probably not as nicely made as the later LTM Canon rangefinders or Leicas - though neither of which I've handled. 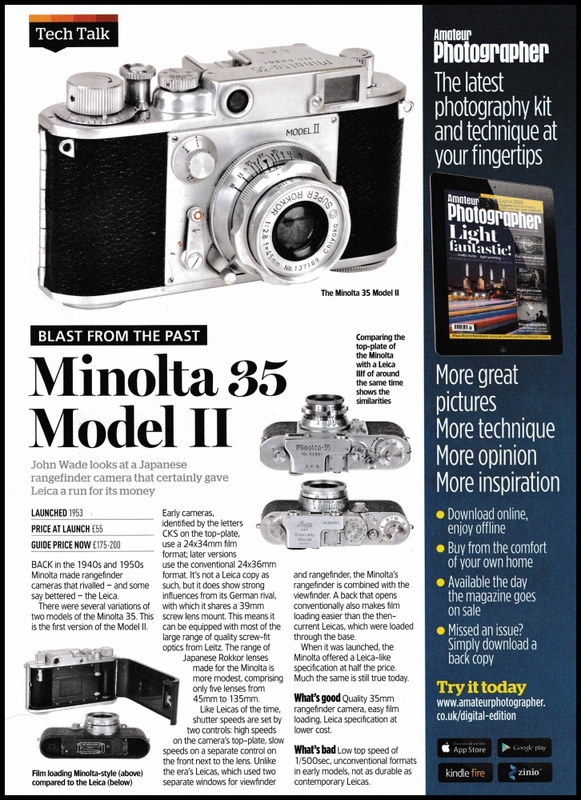 Minolta was set to release a modern M-Mount 'Sky' onto the market when Leitz expressed 'concern' (so the story goes), and eventually Minolta dropped interchangeable rangefinders to focus on the expanding SLR market anyway. It would have come equipped with a 5cm F1.4 Super Rokkor. Certainly, that is a camera that looked superior to the M3. I'm towards the end of shooting some Kodak Gold 200 through it but I'm not sure when I'll have it developed as I send my rolls in bulk. I paid a pretty penny for it! Full CLA will be another $150 odd. Even then, it will have been a good deal compared to the going rate, particularly for the lens of which most (as well as most lenses of that period in general) have scratched elements. Mine is mostly very clean and I've just got a clear UV filter to keep it that way. The lens is the same made for the bayonet Super A camera, besides the mount. They are found with distances marked in feet or metres - for USA/Aus/Europe, and Japan. The production estimates are about 5000-9000. Some of the Canon rangefinder cameras are fewer, so it's not so special except to find them in excellent condition. There was also produced a very rare LTM 35mm F1.8 - estimates between 120 and 300! Only one has been seen in a private collection. Likewise only 1 Minolta Sky pre-production prototype has been shown - whereabouts since 2005 is unknown because it used to be in the former Minolta Museum (Minolta Gallery) - wouldn't surprise me at all if KM binned it. Another one supposedly exists in private hands. Chyioda sounds legendary next to Nippon or Kyocera. Chiyoda sounds legendary next to Nippon or Kyocera. I like them all! It's interesting just how often Japanese companies changed their business/trading name, too.